This mushroom and barley soup is very soothing. 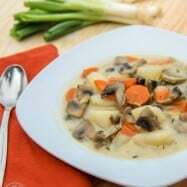 Ladle it into your bowl, deeply inhale the warm steam, pull the spoon to your lips and savor. You’ll probably be smiling while you ruminate on the flavors. It was my comfort food all last week when I wasn’t feeling well. It’s really simple, healthy and delicious. 1. 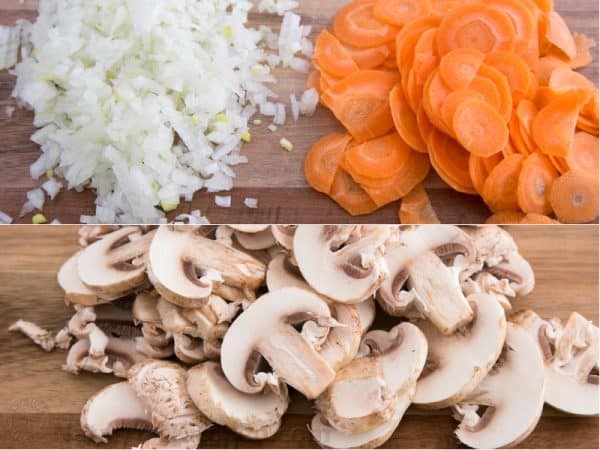 Prep your vegetables by: dicing 2 onions, slicing 1/2 lb of mushrooms and thinly slicing 1 carrot. 2. 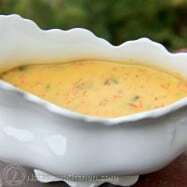 In a large soup pot heat 2 Tbsp of oil and 2 Tbsp of butter. Add 1/2 cup of barley along with diced onions. Cook over medium heat for 5 min, stirring constantly. 3. 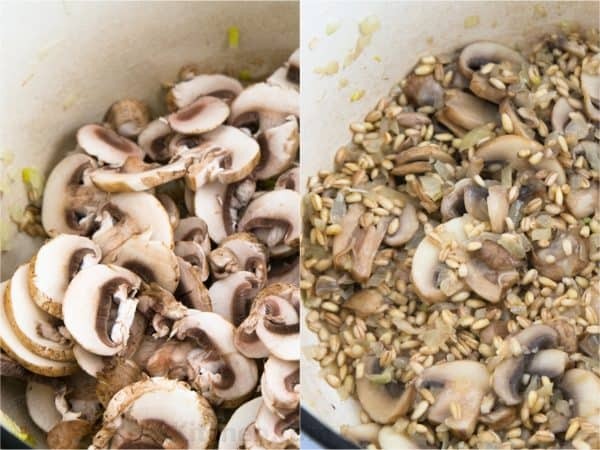 Add sliced mushrooms and cook for another 5 min or until mushroom liquid has evaporated. 4. Next, add 8 cups of reduced sodium chicken broth, sliced carrot, 1/2 tsp of salt and 1/4 tsp of ground pepper. 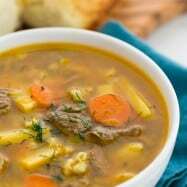 Bring soup to a boil and use a spoon to skim impurities off the top. 5. Cover and simmer on low heat for 1 hour, stirring every 15 minutes. Remove from heat and sprinkle with parsley or dill before serving. 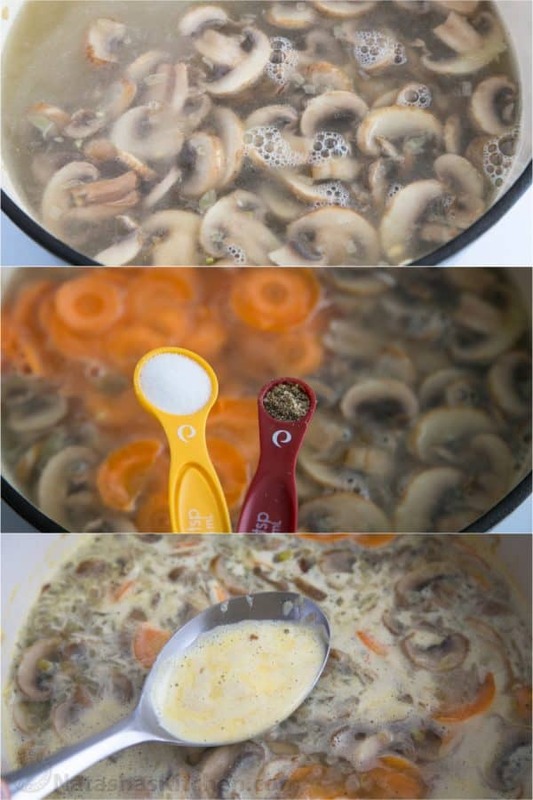 Dice 2 onions and slice 1/2 lb of mushrooms, and thinly slicing 1 carrot. 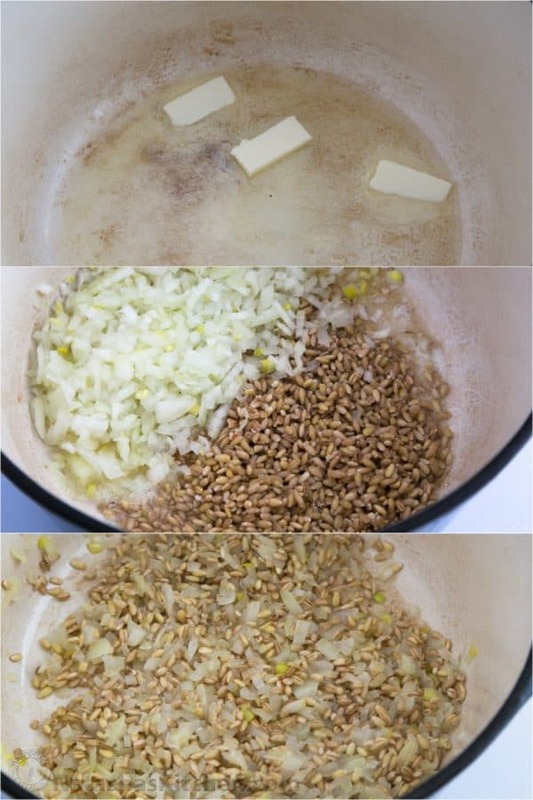 In a large soup pot heat 2 Tbsp of oil and 2 Tbsp of butter, then add 1/2 cup of barley along with diced onions. Cook over medium heat for 5 min, stirring frequently. 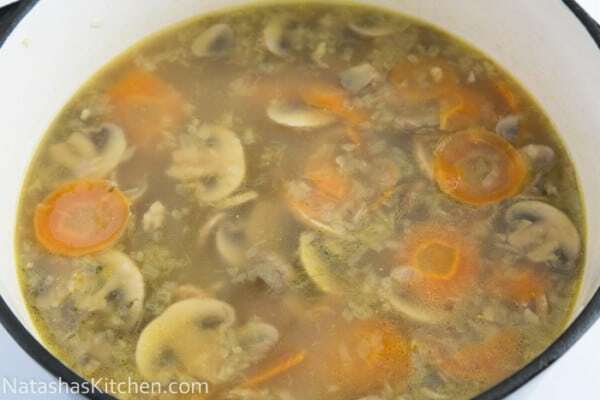 Add sliced mushrooms and cook for another 5 min or until mushroom liquid has evaporated. Next, add 8 cups of chicken broth, sliced carrot, 1/2 tsp of salt and 1/4 tsp of ground pepper. 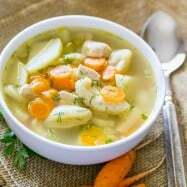 Bring soup to a boil and skim off impurities that float to the top. Cover and simmer on low heat for 1 hour. stirring every 15 minutes. Remove from heat and sprinkle with parsley or dill before serving. Thank you for the great recipes. 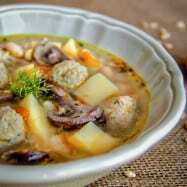 I have made quite a few of your dishes and loved them! 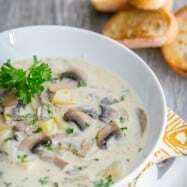 I love how easy, healthy and delicious they are! 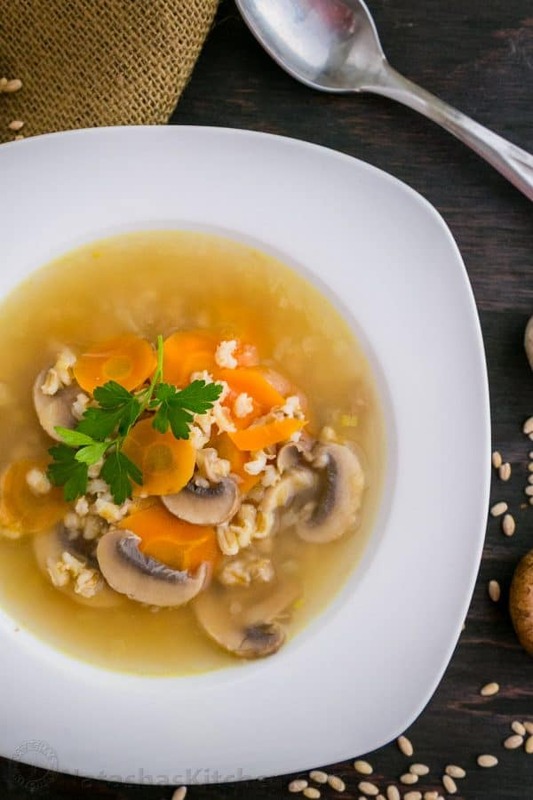 Question – what type of barley did you use? Pearl or hulled? 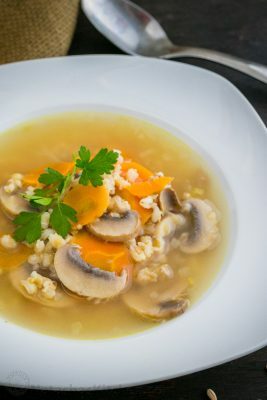 I want to make this tonight and have hulled barley at home, as I have read it is much healthier than pearl barley. Yes, it does take longer to cook. 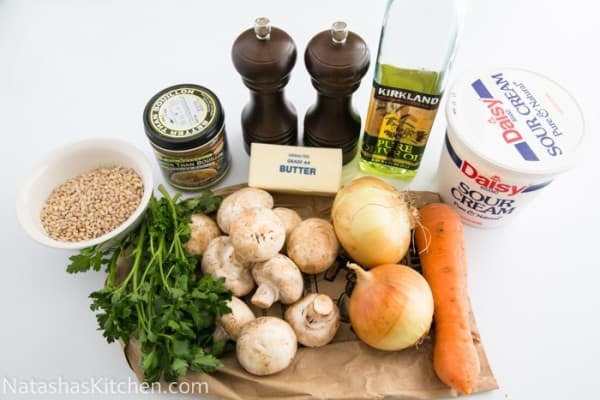 I think I’ll cook the barley separately and will add it to the soup when it’s done.